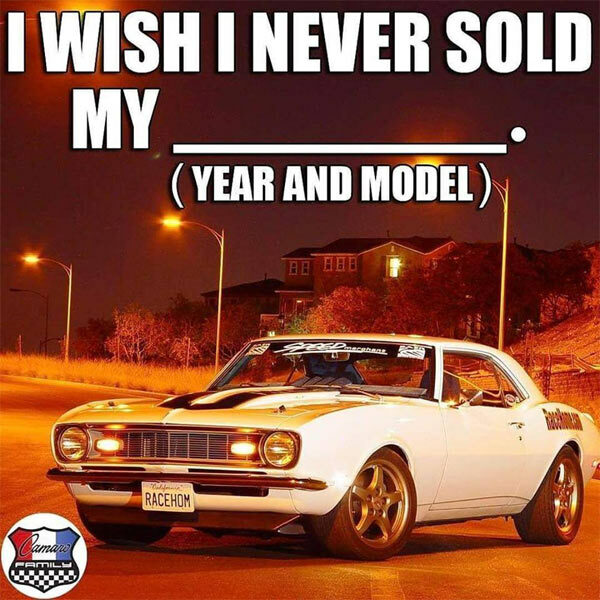 Images like the one attached pop-up on social media from time to time saying things along the lines of, ‘I wish I’d never sold my (insert car make and model. )’ You have to reminisce about a certain car which you had for a while, usually picked up for a reasonable amount and is now worth a small fortune. It’s a bit depressing really to tweak your negative memory banks for those muscle cars owned in the past which could now be worth loads. It’s all done lightheartedly and with humor, but it’s also a bit like an investment turned away years ago, which has now shot up in value. Once you get to a certain age and you’ve gone through a quite a few cars over the years, more or less everybody has owned something in the past which has now gone up in value. This could have been decades ago or just last year, but the reasons for anybody selling a car are as numerous as the makes and models themselves. You simply wanted to buy a new car, it was too expensive to repair, it become too unreliable, the list goes on. It’s great to have hindsight thinking you should have kept that rarity from 1970, but for most people that means hanging onto a vehicle for a few decades and hoping the value increases. For those who do hang onto their cars in the hope they go up in value, they can be shoved in the back yard, sat for a few decades until they become part of the surroundings, half rot away and become the barn and field finds of the future. It’s the minority that stick these vehicles in temperature controlled garages for years. Some cars are clearly going to be future rarities from the amount of options they have, one-off models, etc., but it’s never clear cut. This is clear from rarities still being dug up as field barn finds. Seeing the worth today is a lot harder than in 20+ years time. So if you have owned a rare muscle car in the past, sold one and it’s now worth a fortune, don’t feel so bad. Getting all poetic, the best way to sum this up is from the poem by Alfred Lord Tennyson, ‘Tis better to have loved and lost than never to have loved at all.’ In other words, it’s better to have owned one of these rarities and enjoyed it for the time you had it than not at all. This is especially true for those who owned a rare muscle car back in the day and bought it for a reasonable amount. You would have also enjoyed driving it on much clearer roads, with less expensive gas prices are probably at a time when everybody had drum brakes and didn’t mind leaf spring suspension. So, it’s always better to have owned a fine vehicle even for a short period than not at all. If you want to own one again, you’ll have to pay far more money, but that’s the name of the game with car appreciation. The other takeaway is look at what you have now or buy a car which could be a future rarity. You just may have to hang onto it for a few decades, store it in a temperature controlled garage and only drive it for 3 miles a year……..